As my oldest has gotten more and more into reading his own books, there are not nearly as many times when he is willing to sit down and just listen to a book I'm reading aloud to everyone else. Car trips are one exception (captive audience! ), but usually he is reading his own book while sort of listening in to what I'm reading at the same time. 4 stars: Solid storytelling, with a hook that's hard to resist: toys coming to life! William's housekeeper is leaving the family. She has been his best friend, cheerleader, and confidant for the past 10 years, and he can't accept the fact that she's really going. His parents aren't awful or anyting, they're just busy, and not very connected with his life. Before she leaves, she gives William an amazing gift--a large play castle. Yes, it's in the attic. (How did you guess?) He has always been fascinated by the castle and now it's his to keep and play with! He should be more excited. It's just that, no castle can replace her. Then she also gives him something else--a silver knight just the right size for the castle. When William holds the knight something amazing happens--the little man comes alive! He tells William the story of an evil wizard who must be defeated in order for Sir Simon to reclaim his kingdom. It's not until later that William realizes he will have a role to play in this quest. By then, it's too late to back out. William was small for his age, but he's strong, thanks to his gymnastics. However, it was not his physical size or strength that mattered in the end, but what was inside his heart. 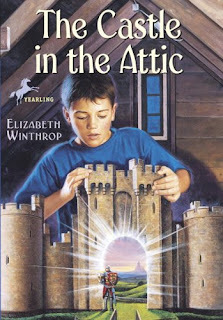 The quest itself, including the big showdown with the wizard, wasn't overly long or suspenseful. The ending was quite satisfying. Right on point for this age group. Ultimately, this was a story of redemption and growth for William. There's something he wanted so badly that he was willing to risk hurting someone he loved to achieve that end. The resulting consequences, however, were more serious than he anticipated. He was sorry for what he had done at that point, but "sorry" didn't change what had happened. Fortunately, there was a way to redeem himself: the quest. He became just as determined to succeed and make things right as he was to get his own way earlier. Considered a children's fantasy classic. I want to read it to my younger 2--I'm sure they would both enjoy it, as well. 3.5 stars: Kids will be happy to return to this world for another adventure. In this second installment, William is now 12, but still short and small for his age. His friend Jason has grown several inches lately, and has gotten really into biking. He is constantly talking about training and working out. William still does gymnastics, but is thinking about quitting. It's becoming harder and harder to find common ground with Jason. A rite-of-passage for boys in their town is "jumping the trains;" essentially, climbing onto a train car as it slows down close to town, then going up and over the other side and jumping off before the train gets going too fast. It's dangerous and the very thought makes William's stomach curl, but he feels like he has to do it to be accepted by Jason and their other friends. Then for his birthday, his former housekeeper sends him a magical token that can take him back to the world of the Castle. Speaking of the Castle, he still has it upstairs, but hasn't really played with it very much lately. This time he decides to tell Jason about the token, the magic, and the Castle. Skeptical at first, Jason soon becomes eager to experience it all for himself. The two friends re-enter the magical world of the Castle, only to find that a different threat hangs over Sir Simon's kingdom--one that Sir Simon himself refuses to even acknowledge. 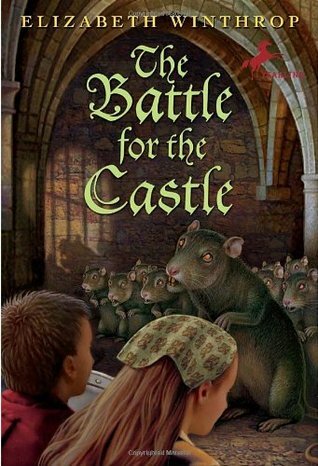 It will be up to the boys, and a girl named Gudrin, to defeat the plague that is poised to descend upon the Castle, destroying everything and everyone in its path. This one was as much about William becoming confident in himself--despite what he saw as flaws--as it was about another adventure in the Castle. William came to recognize his own leadership abilities when the chips were down. He also realized that physical prowess was not the only helpful attribute in hard situations. His ability to think under pressure was just as useful as big muscles, if not more so. My one quibble was with the ending. After building up some good suspense, the solution itself was a bit anti-climatic. After they won, I thought--"Wait, that was it? That's all it took?" I don't think kids will mind, though. The creepiness of the rats in the first place may make the quick resolution a relief. One of my favorite parts of the book, from a parent's perspective, was William's realization at the end about jumping the trains, and Jason's respect for him in that moment. If you've read the first, this one must follow! Have you read either of these? Which one was your favorite? I didn't know that about you, Pam! I was a children's librarian, too! I go to a book club now to help me expand my reading to adult books, but I still prefer children's books. :) Thanks for this comment.